CLA (conjugated linoleic acid) is a recently recognized suplement derived from Safflower oil. Tonalin??? 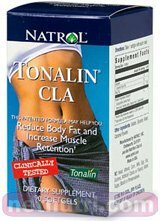 CLA is the only patented form of conjugated linoleic acid. Does Not Contain: Yeast, wheat, corn, milk, egg, soy, glutens, artificial colors, flavors, sugar, starch, preservatives.